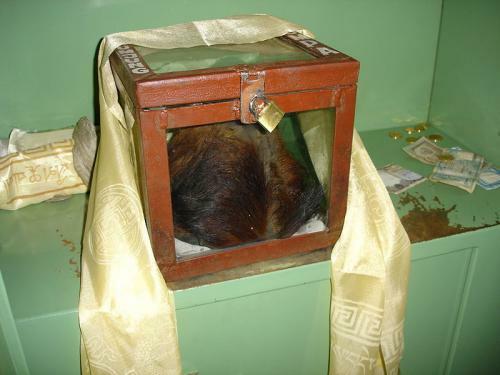 Purported Yeti scalp at Khumjung monastery. Credit: Nuno Nogueira / Wikipedia. A British scientist says he may have solved the mystery of the Abominable Snowman—the elusive ape-like creature of the Himalayas. He thinks it's a bear. DNA analysis conducted by Oxford University genetics professor Bryan Sykes suggests the creature, also known as the Yeti, is the descendant of an ancient polar bear. Sykes compared DNA from hair samples taken from two Himalayan animals—identified by local people as Yetis—to a database of animal genomes. He found they shared a genetic fingerprint with a polar bear jawbone found in the Norwegian Arctic that is at least 40,000 years old. Sykes said Thursday that the tests showed the creatures were not related to modern Himalayan bears but were direct descendants of the prehistoric animal. He said, "it may be a new species, it may be a hybrid" between polar bears and brown bears. "The next thing is go there and find one." Sykes put out a call last year for museums, scientists and Yeti aficionados to share hair samples thought to be from the creature. One of the samples he analyzed came from an alleged Yeti mummy in the Indian region of Ladakh, at the Western edge of the Himalayas, and was taken by a French mountaineer who was shown the corpse 40 years ago. The other was a single hair found a decade ago in Bhutan, 800 miles (1,300 kilometers) to the east. Sykes said the fact the hair samples were found so far apart, and so recently, suggests the members of the species are still alive. "I can't imagine we managed to get samples from the only two 'snow bears' in the Himalayas," he said. Finding a living creature could explain whether differences in appearance and behavior to other bears account for descriptions of the Yeti as a hairy hominid. "The polar bear ingredient in their genomes may have changed their behavior so they act different, look different, maybe walk on two feet more often," he said. Sykes' research has not been published, but he says he has submitted it for peer review. 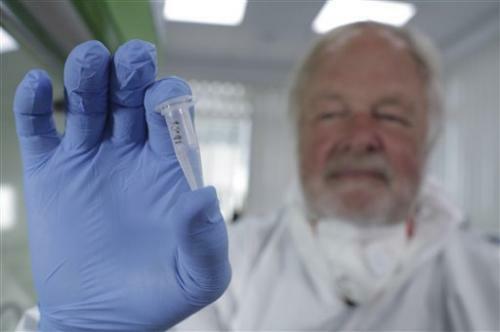 His findings will be broadcast Sunday in a television program on Britain's Channel 4. Tom Gilbert, professor of paleogenomics at the Natural History Museum of Denmark, said Sykes' research provided a "reasonable explanation" for Yeti sightings. "It's a lot easier to believe that than if he had found something else," said Gilbert, who was not involved in the study. "If he had said it's some kind of new primate, I'd want to see all the data." Sykes' findings are unlikely to lay the myth of the Yeti to rest. The Yeti or Abominmable Snowman is one of a number of legendary ape-like beasts—along with Sasquatch and Bigfoot—reputed to live in heavily forested or snowy mountains. Scientists are skeptical, but decades of eyewitness reports, blurry photos and stories have kept the legend alive. "I do not think the study gives any comfort to Yeti-believers," David Frayer, a professor of biological anthropology at the University of Kansas, said in an email. But "no amount of scientific data will ever shake their belief." "If (Sykes') motivation for doing the analyses is to refute the Yeti nonsense, then good luck," he said. Sykes said he was simply trying "to inject some science into a rather murky field." "The Yeti, the Bigfoot, is surrounded in myth and hoaxes," he said. "But you can't invent a DNA sequence from a hair."